One of the perks of being a blogger - that is a serious, passionate blogger we’re talking about here (ehem, ehem) - is attending exclusive events and parties where you get to meet beautiful and nice people from different walks of life. Alongside with meeting different people, is getting a chance to be a part of something spectacular and something wonderful. There goes you’ll be a part of a product launch, or a premier night or something more fun like a celebration of something great that happened or will happen. And part of all the celebrations and launching and premiering are the freebies or let’s call them “thank you gifts” that you’ll surely enjoy, and so far, the best “gift” that I received was staying in a very beautiful hotel like Hotel H2O. Located at heart of the metro, this newly established and the first aquarium-themed urban resort hotel in the country is a proud member of WORLDHOTELS – the largest and most established Europe-based global hotel group for independent hotels and regional hotel brand is. 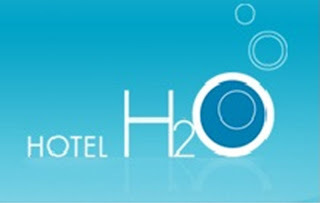 Hotel H2O has two floors connected by a long aquarium wall, housing the Club H2O Lounge, Fitness Centre and Spa. With 130 rooms and 17 suites, they are categorized into three parts – the Park View rooms facing Luneta, the Bay View rooms facing Manila Bay and the Aqua Room with aquarium walls (this is where I stayed). See? I love my room so much that I didn’t wanna go out! Hehehe. The aquarium wall is really, really great up close. My room has an LCD television with remote control, private in-rooms safe, bedside alarm clock, refreshment bar, high-speed Internet access, bathroom with individually designed toiletries, hair dyer, telephone and voicemail with international direct dial, refrigerator and complimentary tea and coffee making facilities. Another thing that I love about this hotel is you’ll never get bored. Hotel H2O is at the same building as Manila Ocean Park where a lot of great and wonderful activities await you. There’s Oceanarium, Jellies: Dancing Sea Fairies, Acquatica – another newbie in Manila Ocean Park’s compound, Spa, Sunset Quay, Fitness Centre and restaurants and bars like White Moon Bar and Makasuntra Asian Food Village – a Southeast Asian Cuisine restaurant and a food museum. Makasuntra, for me, is the oasis of Asian food lovers. This is, indeed, Manila’s newest offering for all the people out there who wanna relax and feel the life under the sea with a very creative and elegant feel. I enjoyed and loved this place, I’m sure you’ll do too! Hi, great room indeed! But i was wondering, the wall really looks like a small aquarium that fits the size of the window. Or is it supposed to be a huge man-made underwater view? Regards. The Aqua room does not have other open view like the luneta or the bay? enclosed lang buong room? Thanks! The Aqua Room does not have other view like the luneta or the bay?Thanks!